DataMites's Certified Data scientist with R program covers all the data analytics techniques using the latest tools like R, Python, Tableau, Machine Learning and MiniTab. This course allows you to obtain an in-depth knowledge by laying a strong foundation and covering all the latest topics. In recent years, Python has become most preferred language for Data Science and considered as powerful and flexible platform for building Machine Learning systems. In the world of Big Data, where data comes in high volume, high velocity and variety , making a data driven business decision become very crucial for business success. Machine Learning models plays a significant role with learning algorithms in turn these big data in to valuable insights. DataMites's Certified Data scientist with R program covers all the data analytics techniques using the latest tools like R, Python, Tableau, Machine Learning and MiniTab. This course allows you to obtain an in-depth knowledge by laying a strong foundation and covering all the latest topics. The increasing demand curve for data analytics professionals to manage the large set of data in various organizations along with this course certificate can transform you into a successful data analytics professional. Why this course "Certified Data scientist with R"? This course comes as a perfect package by allowing you to learn about entire data lifecycle and all the methods to achieve the same. You would not just learn about the data analytics techniques and tools but also learn on how to apply them to raw data and obtain business insights. Gained a better knowledge on how the Business statistical Analytics work and its lifecycle. Learned to perform data analysis for large set of data using all the latest tools like R, Python, Tableau, Machine Learning and MiniTab. Attained the ability to work with different data formats like CSV, XML, SPSS, SAS, etc. Advantages of learning course "Certified Data scientist with R"
Data science is the hot field that is booming up now. Be it a small company or an MNC, they need a Data scientist to manage their large pool of data. High demand for data scientists with only a few qualified people to hire, the companies are ready to offer extremely fat salaries to those who have completed this course. This course not only fetches you loads of career opportunities but also allows you to apply the new age skills in your current work and prove to senior management that you are efficient and knowledgeable. Be assured that you are entering the future of analytics much earlier to grab those wonderful opportunities arising from this biggest need of the business world. This course “Certified Data scientist with R” is not restricted to any specific domain. Fresh Graduates or students from any discipline can choose this course to obtain better job opportunities in this most demanding data analytics field. Working professionals looking to change their domain to analytics field can also opt this course. Highly recommended for those who are aspiring jobs that mainly revolves around data analytics and for those who have a keen interest or a basic knowledge of statistics and mathematics. Being one among the handful companies offering this Data Science training, DataMites assures you an industry tailored training program from best trainers. The combined learning of theoretical and practical sessions can help you with a clear idea of all the concepts. 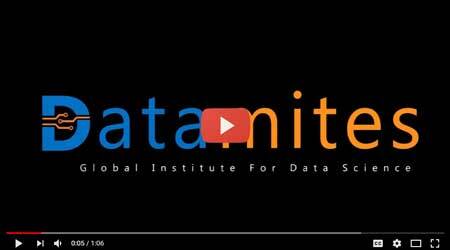 DataMites's Certified Data scientist with R course will give you the edge in the competitive market. Is this an online or distance course? This an online program and you can learn conveniently from your home. This course is perfectly aligned to the current industry requirements and gives exposure to all latest techniques and tools. The course curriculum is designed by specialists in this field and also have been monitored by industry practitioners. We guarantee that you can achieve an in-depth knowledge and an enhanced skills but we do not provide job assistance. The following topics are covered in "Machine Learning"